Materials scientists in Sweden are developing the technology for 3D printers that can turn leftover plant material into full-sized houses. Umeå University in the north of the country will host a project with a sub-goal of producing cellulose-based materials for full-scale 3D printing. That could include anything from doors and vents to walls and eventually entire structures. Meanwhile, materials scientists at Chalmers University in the south recently announced successes in printing with cellulose at a smaller scale. Their experiments combined cellulose with carbon nanotubes to create electrically-conductive materials based on wood, rather than fossil-based plastics and metals. "The idea of the project is to develop a technology that can be used in reinforcing the manufacturing industry in the region," said Marlene Johansson, the director of Sliperiet - the centre that will coordinate the research in Umeå. Sliperiet and its collaborators have received £1.34 million from the EU to create a regional cluster for digital manufacturing and sustainable building. 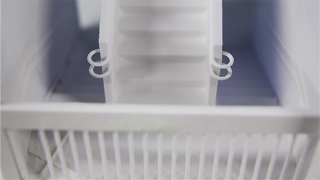 "Combining the use of cellulose with the fast technological development of 3D printing offers great environmental advantages," added Paul Gatenholm, professor of biopolymer technology at Chalmers. "Cellulose is an unlimited renewable commodity that is completely biodegradable, and manufactured using raw material from wood, in essence allowing us to bind carbon dioxide that would otherwise end up in the atmosphere."